"Yamaha keyboards were used for all of the Australian Idol shows. The Clavinova was front and centre, supported by several models of the MOTIF series. All performance shows were live, so reliability was non-negotiable, the variety of music ranged across every style from music theatre to heavy metal and Yamaha keyboards were always able to provide the exact patch required." 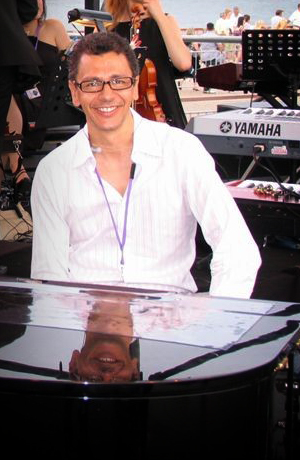 An accomplished pianist and musical director, David has performed and recorded with the cream of Australian and international talent, from Kylie Minogue to Jimmy Barnes and Shirley Bassey. Much of David’s time is spent orchestrating for television and production shows, including seven seasons of Australian Idol, where he was also Musical Director and programmes such as the Logie Awards, Carols By Candlelight, and So You Think You Can Dance. David has orchestrated and performed for several major Australian musicals, including the original productions of Shout, Burn the Floor and Priscilla, Queen of the Desert. David is currently touring with Marcia Hines, with whom he has been working for many years.